The clinical success of checkpoint inhibitors has made Immuno-Oncology an amazingly "hot" area for pharmaceutical and biotech deal making. With checkpoint antibodies seen as backbones for combination therapy in cancer, many in Oncology are asking... "What's the Role of Non-IO in an IO World?" Due diligence and finance experts from global pharmaceutical companies join legal advisors and consultants to share their expertise in a lively discussion on the issues that arise during due diligence. The panelists discussed why immuno-oncology is so hot, if it is too late to get into PD1 and other checkpoint inhibitors, how they judge immuno-oncology combinations, if CAR T can go into solid tumors, the impact of business models on cell therapy, winning strategies for deals in immuno-oncology licensing, cell recruitment, innate immunity, licensing criteria, biomarkers, deal terms, and more. The panelists discussed theories of cancer, favorite targets and modalities, the impact of reimbursement, deal types, and more. In order to thrive, biotechnology firms must successfully license their discoveries or, as is increasingly more common these days, partner with large pharmaceutical firms to develop their product. The right time to seek a partnering or licensing agreement and who to seek it with can be a daunting task, but breaking it down into the major elements that need to be considered will help you to develop an actionable plan. Biotech companies seek partnerships (collaborations, licensing deals, joint ventures, etc) to advance their drug candidates and raise funds. They frequently ask "How much is this drug candidate worth to a partner?" 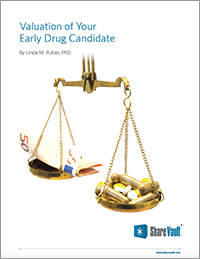 In this new white paper, author Linda Pullan reviews the different techniques, key variables, and characteristics of what makes a drug candidate more valuable to a partner. Find out how valuation gets translated to deal terms and get a clear, conceptual framework for your drug's valuation. To get a partnering deal done, you must persuade people you may never meet that your opportunity is the right one for them The partnering presentation, whether an elevator pitch, a one-pager, or a non-confidential deck, plays a key role in getting to a deal. In this webinar, Linda Pullan shares lessons she's learned over 20 years of doing in-licensing and out-licensing deals, with big companies and small companies. An overview of biotech and pharmaceutical partnering with facts, fallacies, and tips. In this webinar, Linda Pullan provides a review of the rules of the partnering game - whether it's partnering from preclinical to late clinical development - to provide an understanding of what to expect in moving from introductions to negotiations of a license or acquisitions and how to win with a clear strategy. Biotech companies seeking to partner their drug candidates should decide in advance what they want to achieve in deal negotiations. Getting the best outcome depends on non-financial, as well as financial terms. In this webinar, Linda Pullan discusses negotiation goals, BATNAs and power, the process to the deal, the basics of term sheets, and common deal structures.